Jan is going over the production schedule, his words spilling out at maximum velocity. He’s well-versed in the intricacies of project management. It’s his passion, so there’s no need for him to search for words, no witty asides to pad the monologue. Further, he knows how to speak like an adult, with an even staccato cadence and an impressive vocabulary by any measure. He makes preemptive oblique references to counterpoints I might raise without breaking the flow, and raises a single eyebrow as he riffs on a matrix of potential implications. The man is a maestro of the salient point, a rhetorical surgeon. But Jan still eats like a starved rat–so I judge by the daily saliva symphony that winds its way down the hall into my cubicle–and all I can focus on at this moment is the glistening post-lunch rivulet clinging to his beard. When I first experienced it I thought the volume and clarity of Jan’s gustatory prowess might have something to do with the acoustic peculiarities of our office, which was converted originally from an industrial loading station. Perhaps the concrete walls of the past century worked in concert with the 21st century floor-to-ceiling frosted glass partitions to act like a massive inner ear, with myself at the focal point. No matter how articulate Jan is, it’s impossible for me to take him seriously when I can still hear the juicy click of his last gulp ringing in my ears–it’s all I can do to block the thought of the sloshing of his gastric contents. I know that I tend to focus to the point of obsession, but it wouldn’t be an issue if he didn’t lick his apple after each bite to keep it from dripping. I witnessed as much as I passed by his office in search of a fire hatchet with which to behead him. So horrified was I that I lost my way and ended up wandering around somewhere in Human Resources, I don’t even know where. The image haunts me to this day–there are some things you cannot unlearn. It’s not just Jan, I don’t want to listen to anyone feeding. I don’t appreciate constant reminder that there are metabolic processes occurring in the multicolored jelly-bags just beneath our sallow flesh. It’s bad enough suddenly becoming aware of someone’s tongue flicking against their yellow teeth like a trout on warped pier boards, let alone encountering the bouquet of banana still seasoning the mucous of their throat. I remember being a prisoner in my high-chair, sitting in helpless thrall as my great grandfather ate vast bowls of apple sauce, his molars clashing together like the Symplegades between each spoonful. Was such merciless gnashing strictly necessary? What demons chittered in his ears? But no, his face was always kind, and his eyes distant. He was a man at peace from all outward appearances, yet just beneath his sinewy cheeks his jaws worked that applesauce like pumice. My own teeth were still new to me then, my precious, pointy little rice grain teeth, and the sound of my elder’s eroded enamel slabs squeaking against each other through liquefied fruit was a thousand mouse feet on my spine. The imprint of that formative experience left me prohibitively sensitive to the aural implications of consumption. Still, as I’ve attempted to mask Jan’s oblivious lip-smacking assaults with loud music, or synchronous stapler-mashing, or cricket-like corduroy agitation, the very knowledge of the feeding keeps me on edge. 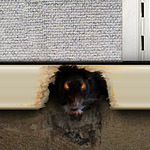 I am beset by twitchy, nose-whistling beasties, yellow-toothed rats scratch scratch scratching at my cubicle walls. I see them for who they are–it takes more than khaki slacks and a necktie to veil biology’s horrid truths. Worse, thanks to the slavering vermin in the next office, I’ve lost my own appetite. This entry was posted in work by scamper. Bookmark the permalink. Another fellow food-listening sufferer! I can’t take the sounds of nibbling and noshing and gnashing! Each click of the teeth sends shivers down my nerves and I feel like screaming! I know I probably also make noise or don’t look so wholesome eating as I would like to look; but I go nuts when other’s eat! Recently I was at someone’s house when their child played with their food; mom stopped them of course, but I almost lost my lunch. Just thinking about it makes me ill; as a mom of five you would think my stomach had become hardened, but no, that isn’t the case. Macaroni & Cheese and pretzels may be on opposite ends of the soft-hard spectrum. But they are the epitome of absolute grossness when it comes to listening to people eat.I can help but visualize the noodles breaking apart and squishing between a set of yellow molars. Or the hard dry pretzel mixing with saliva to create a gluey mash sliding its way down someones throat. It is impossible to concentrate on a conversation or movie plot when such repulsive noises fill my ears. “A thousand mouse feet on my spine.” You’re the best, mister.